USDCAD started the May 4th 2014 economic week with a quantitative trade bias to sell this Forex pair and buy the Franklin Dollar Index (FDX). This turned into a 150+ pip assault on the Dollar as the FDX slumped ahead of Federal Reserve Chair Janet Yellen's Testimony on the US Economy. The trade eventually materialized as USDCAD continued to move lower, decoupling further from the FDX which was staging a recovery following Yellens' stance on Monetary Policy. USDCAD consolidated around the 1.0820 area before surging higher after the market was surprised with an unexpected decline of ~29K in CAD Employment (Est. +~13K). Looking ahead to the May 11th 2014 Forex Trading week, USDCAD is currently facing initial resistance near the ~1.0900 area. 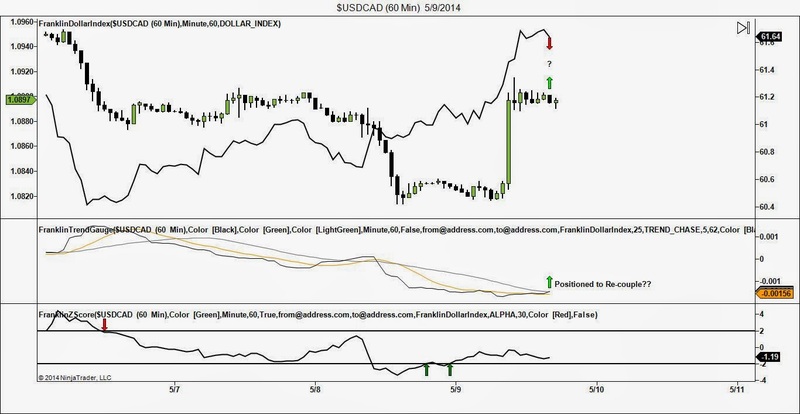 The Franklin Trend Gauge appears positioned to issue a buy USDCAD sell FDX trade. This trade bias is supported by the Franklin Z-score which triggered on May 9th 2014. Analyzing the chart above, the wide spread gap being exhibited by the Loonie and Franklin Dollar Index supports the potential for re-coupling. We are expecting a statistical correction between USDCAD and the other Major Dollar based currency pairs.